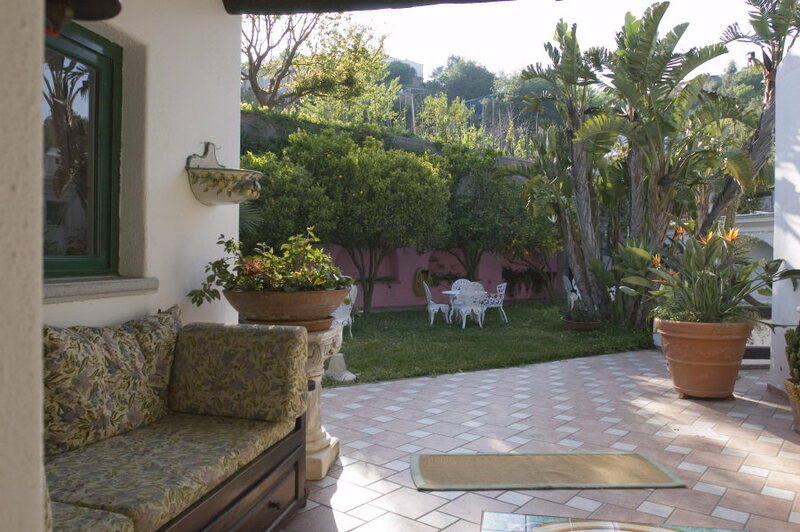 Casa Seralba is a villa absorbed in the vineyards of Panza, an ancient village of Forio’s municipality, on the island of Ischia, and is surrounded by a lush garden of citrus and exotics plants. Casa Seralba proposes the real atmosphere of the "house for guests” of a time where peace and tranquility reign supreme in the shadow of Mount Epomeo, dominant peak of the island. It is distant from the sea about 2.5 km (S. Angelo Bay and the Bay of Sorgeto) and 1 km from the bus stop and from the center. If you are not motorized and do not want to walk this stretch on foot, just ask in advance to rent a scooter or a car that also will make possible to reach freely the most beautiful places of the island. How to reach Casa Seralba. Just get on plane, train or car to Naples or Pozzuoli. From Beverello port there are frequent hydrofoils to Ischia, Casamicciola Terme and Forio (the last is the port of arrival nearest to Casa Seralba, but only for passengers, without a car). There are also hydrofoils from Naples / Mergellina port. Ferries leaves from the port of Naples Porta di Massa or Pozzuoli . For those arriving on foot in one of the ports of the island, a taxi will take 10 to 30 minutes, depending on the port, to Casa Seralba . Guests with cars, however, will have to follow the driving directions to Forio-Panza and make use of free private parking by us.